Vincents Random Waffle: Without craftsmanship, inspiration is a mere reed shaken in the wind. Without craftsmanship, inspiration is a mere reed shaken in the wind. While I imagine Johannes Brahms was referring to music I think the sentiment applies to other endeavours just as well. The trap of believing an idea is worth something without an implementation occurs all too often, however this is not such an unhappy tale. 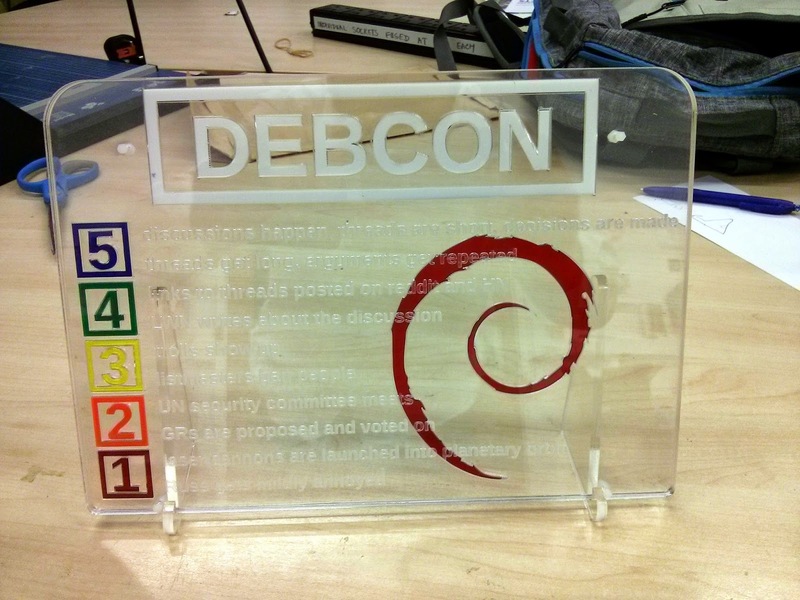 Lars Wirzenius, Steve McIntyre and myself were chatting a few weeks ago about several of the ongoing Debian discussions. As is often the case these discussions had devolved into somewhat unproductive noise and yet amongst all this was a voice of reason in Russ Allbery. Lars decided that would take the opportunity of the upcoming opportunity of Debconf 14 to say thank you to Russ for his work. It was decided that a plaque would be a nice gift and I volunteered to do the physical manufacture. 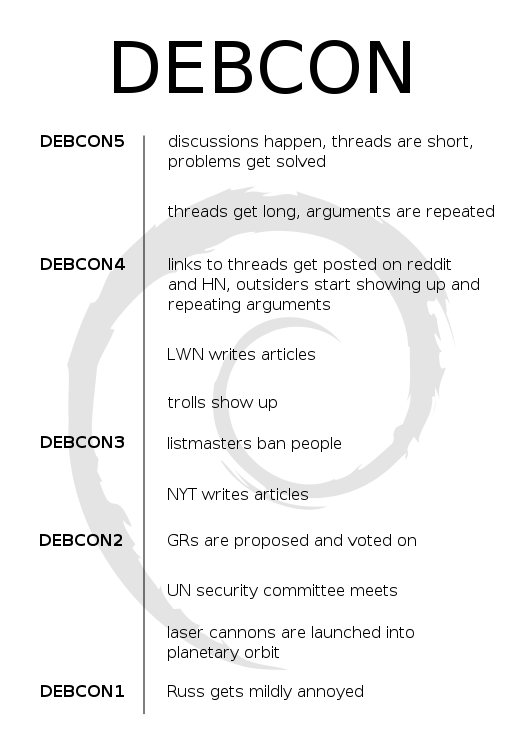 Lars came up with the idea of a DEBCON scale similar to the DEFCON scale and got some text together with an initial design idea. I took the initial design and as is often the case what is practically possible forced several changes. The prototype was a steep learning curve on using the Cambridge makespace laser cutter to create all the separate pieces. The construction is pretty simple and consisted of three layers of transparent acrylic plastic. The base layer is a single piece of plastic with the correct outline. 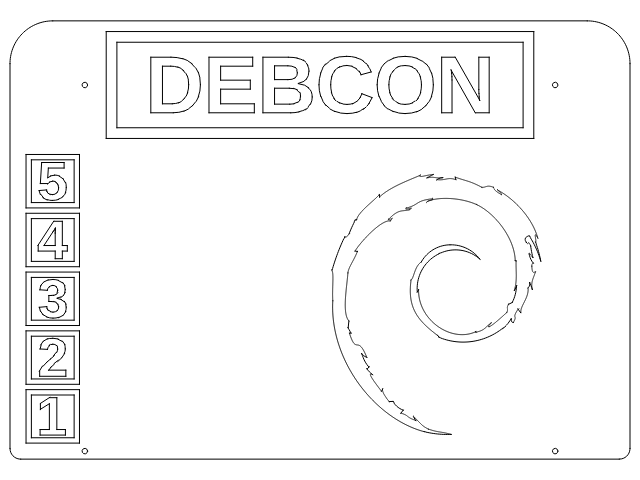 The next layer has the DEBCON title, the Debian swirl and level numbers. The top layer has the text engraved in its back surface giving the impression the text floats above the layer behind it. For the prototype I attempted to glue the pieces together. This was a complete disaster and required discarding the entire piece and starting again with new materials. For the second version I used four small nylon bolts to hold the sandwich of layers together which worked very well. Yesterday at the Debconf 14 opening Steve McIntyre presented it to Russ and I think he was pleased, certainly he was surprised (photo from Aigars Mahinovs). I'm definitely pleased. Thank you so much! That was a wonderful gift. It means a great deal to me. nifty idea, great sense of humour, and nice execution.